Regarding the metal, cookware sold in stores is an 18/10 grade of steel at best. Because of the softness of this grade of metal, when heated, it expands and the food sticks to the pan. You are then forced to cook with oil and the pan becomes difficult to clean. In addition the natural acids and salts contained in our foods can create a chemical reaction with inferior cooking surfaces. The cooking surface of Saladmaster® is 316Titanium stainless steel. It is the highest grade of steel used in the cookware industry and exclusive to ONLY Saladmaster. 316Ti is safe as it does not react with the natural salts and acids of your food and is “corrosion proof” for cooking; no metals or chemicals leach into your food. Saladmaster steel is 2000% more resistant to chemical attack than typical 304 type metal used in other cookware. Storage has never been easier with our exclusive, detachable handles. Plus, they provide for convenient stove-to-table service, turning a pan into an elegant serving piece with just a click. Cleanup and storage are a breeze, too! Simply remove the handles and place in the dishwasher or cupboard. Versa Loc handles are safer and 200% stronger than industry standard. Best of all no screws means no more loose handles! Many consumers believe that if a pan is heavy it is good. It’s not the weight that determines the quality or performance of the pan, it’s how quickly the pan heats up, how well it holds the heat and how well it distributes the heat. Most name brand products on the market have layers of heat conducting alloys on the bottom of the pan ONLY. This means you have to constantly stir your food. Often people become frustrated with traditionally pots ‘n pans because they stick and burn at the bottom where the heat source is. Saladmaster’s cooking vessel is designed with a super thermo-core which is a perfect marriage of metals that distributes the heat 360 degrees. This provides for completely even heat which allows your food to cook faster at lower temperatures, without the need of stirring. The outer layer is a 400 series stainless which is necessary to perform on the new magnetic induction stoves. All our stoves and fridges have a means of controlling temperature, why doesn’t our cookware have one? 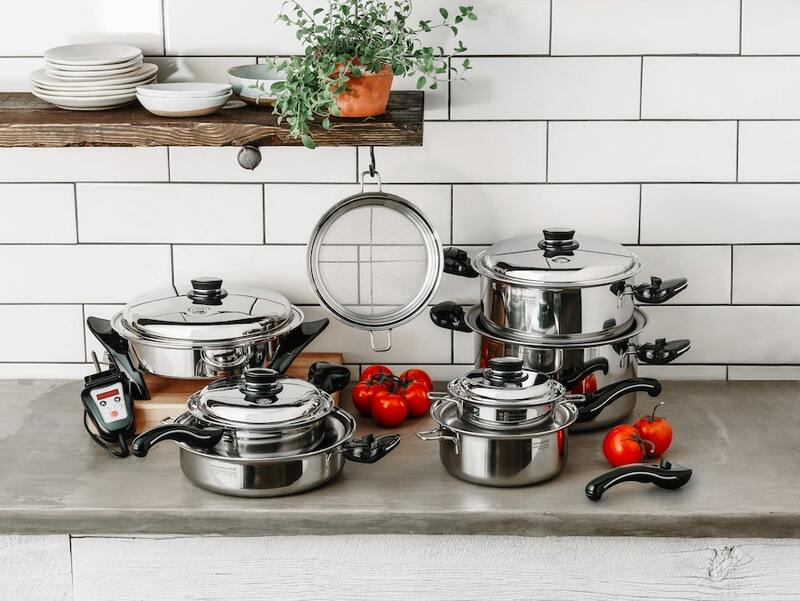 Since the nutrition of our food can be damaged by high heat, temperature control becomes an extremely important factor to considering the cookware you want to prepare your food in. Your vitamins and minerals break down when exposed to temperatures above 200ºF. Common cooking methods such as boiling (212ºF), steaming(232ºF) and micro waving (400ºF) can substantially reduce the vitality of your food. Saladmaster has a patented Vapo Valve activates below boiling and below steaming. Because it cooks quickly at low heat it preserves an average of 93% of your foods nutrients.